As someone who has grown up with curly hair her whole life and has always been surrounded by wavy or curly haired women, I can safely say that nothing can match the thrill that you feel every time you straighten your hair. But the thing is, using a straightening iron regularly can seriously damage your hair, especially if you’re using one that’s of mediocre quality. So, it’s of primary importance that you pick one up that belongs to a reputed brand and is of great quality. And one brand that stands out above others when it comes to hair straighteners would have to be Braun. 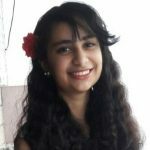 So, here we have compiled a list of the top 10 Braun hair straighteners that are available in India right now. Take a look! 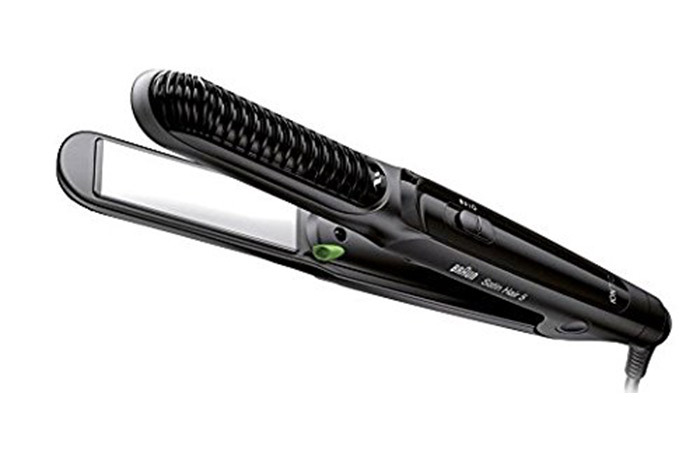 The Braun Satin Hair 3 Hair Straightener consists of (presumably) indestructible 100% ceramic eloxal plates that glide down your hair smoothly. Its manual temperature regulator can be adjusted to 13 heat settings that help provide a wide range of styling options. 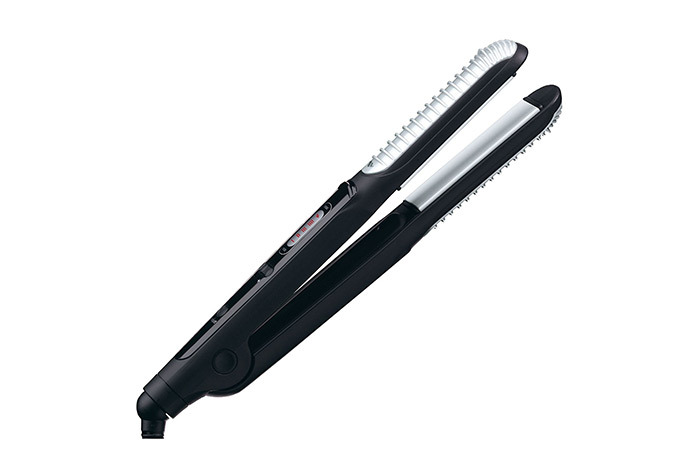 But the USP of this straightener would have to be its 1.5x wider plates that make it easy to straighten thick and long hair. If you’re someone who likes experimenting with their hairstyles, then you should definitely give Braun Satin Hair 5 Hair Straightener a go. The unique curved plates of this iron are designed in a way so that you can not only straighten your hair but also curl them. It comes with 5 temperature settings that go up to 200° C and ceramic plates that provide friction-free gliding. Braun Satin Hair 7 Straightener is made with Iontec Technology that aims to tame frizz and make your hair look smooth and shiny. These active ions also restore the moisture balance of your hair to prevent it from drying out. It also consists of floating ceramic plates that distribute the heat and pressure evenly to prevent your hair from getting damaged. 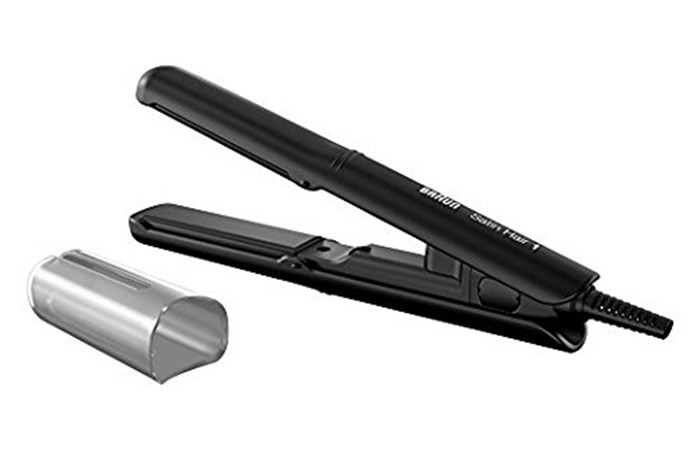 Braun offers another multiply styling tool with its Satin Hair 7 SensoCare Hair Straightener that can be used to style your hair straight, in curls, and in waves. 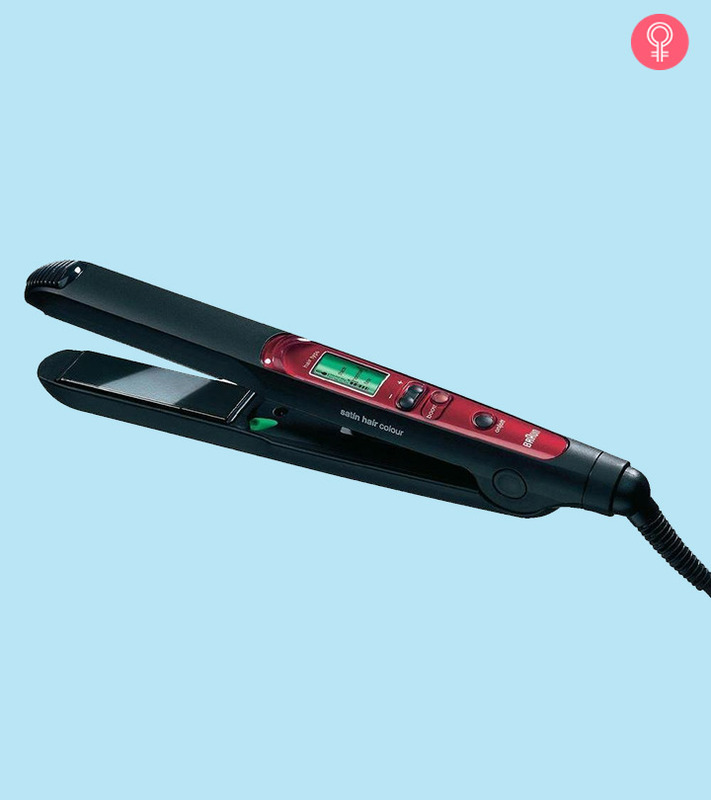 This smart tool comes with built-in sensors that inspect your hair every 20 seconds to adjust to the ideal temperature and protect it from heat damage. It can also save the personal hair conditions of 3 users, making it a breeze to share it with your sister or friends. If you’ve been on the lookout for a good travel-friendly hair straightener, then your search ends here. This Braun Mini Straightener comes with a travel cap that not only locks the plates in place to prevent it from getting scratched by the contents of your bag, but also protects your bag from any residual heat. Braun Satin Hair 7 Hair Straightener emits active IONs that combat frizz and boost shine to give you smoother looking hair. Its LCD display also makes it easy to adjust temperature and improve the overall experience of straightening your hair. Lastly, it glides 3x more smoothly down your hair to prevent hair breakage. The Braun Hair Satin 5 straightener also uses Iontec Technology that releases active ions to give you frizz-free and smoother hair. The plates of this Braun ceramic hair straightener glide smoothly down your hair and are resistant to styling product residues. Lastly, it comes with 3 temperature settings to make for easy, hassle-free functioning. People with color treated hair usually abstain from using heat styling tools as they make the color fade faster. So, this hair straightener is specifically made for this demographic. 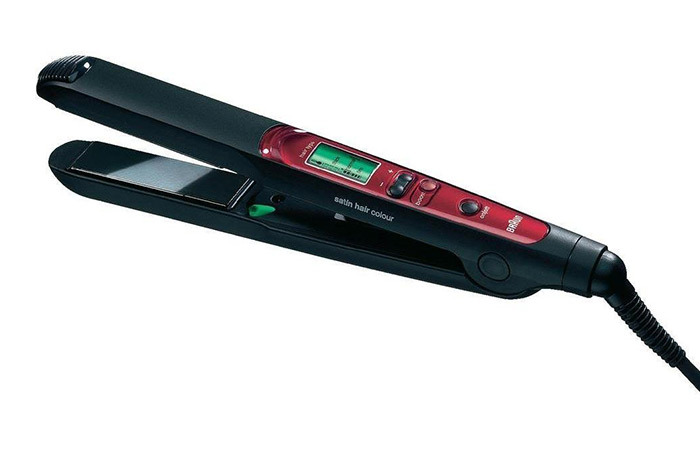 Braun ES3 Hair Straightener is designed specifically to enhance the color of your hair and reduce hair fading by 70%. It also has an inbuilt memory system that allows you to save your setting from future use. Now here’s another hair straightener that you can use while traveling. 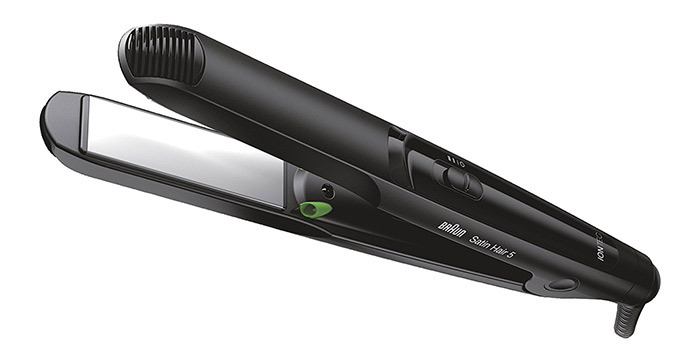 The Braun Satin Hair 3 Style&Go Straightener is equipped with a travel-lock that locks the plates together in place to prevent them from getting damaged in your bag. It also comes with a multi-voltage system that adapts between 100V and 240V to make it easy to use anywhere. 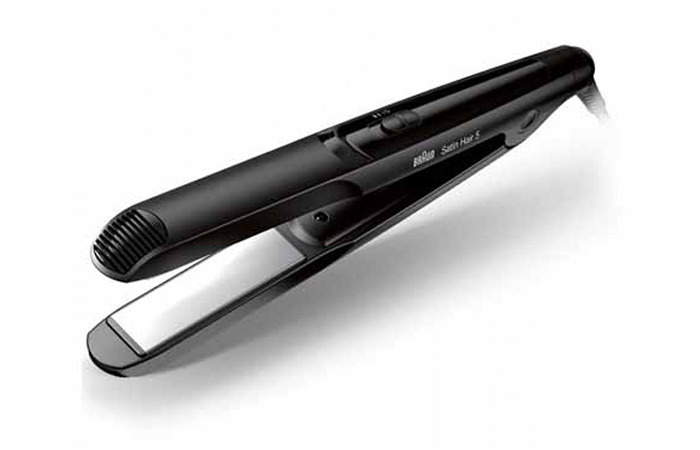 The Braun Satin Hair 5 Multistyler works just as well as a curler as it does as a straightener. The parallel ribs around the circumference guide and curl your hair perfectly. Additionally, its Iontec technology helps eliminate static and fights frizz to give you smooth and shiny hair. And that’s our rundown of the top 10 Braun hair straighteners that you can find in India. So grab one, try it out, and comment below to let us know how it went! Are Braun straighteners supposed to be used on wet or dry hair? As with all other straighteners, even Braun straighteners should only ever be used on dry hair. How long does hair straightening last? Typically, hair straightening lasts until the next time you wash it.